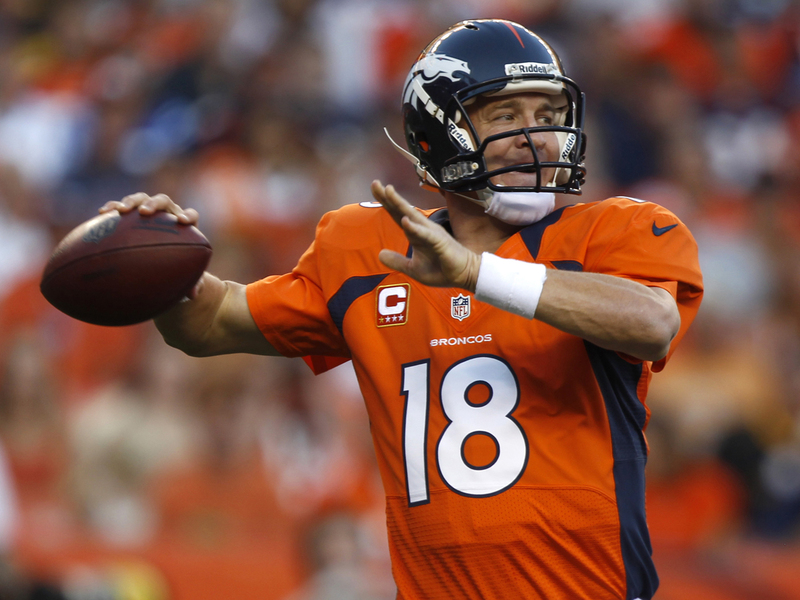 (AP) DENVER -- After 611 days away, Peyton Manning couldn't wait to get back on the field. Ben Roethlisberger seemed determined to keep him on the sideline. Manning overcame Pittsburgh's 10-minute advantage in time of possession and led a hurry-up offense that helped the Broncos beat the Steelers, 31-19, on Sunday night in his Denver debut. "It's just one game. I try to keep it in perspective," Manning said. "I know how hard I've worked to get to this point. I know how much help that I've gotten along the way, from a lot of people. I'm very grateful for that. It's special. I will definitely say it's special." Manning got a big assist from another big-time free agent, cornerback Tracy Porter, whose 43-yard interception return of Roethlisberger's pass with 2 minutes left and the Broncos clinging to a six-point lead sealed the victory. "I should've called timeout," Roethlisberger said. "The play clock was running down, I hate to burn timeouts. I should've. We were kind of all over the place. "There's no one to blame but myself. I already told my teammates and coaches that it's my fault. It's on me. It's disappointing. I hate to let my team down, my coaches, the fans. That loss is squarely on my shoulders. I'll take that and get better and learn from it." Manning, jettisoned by the Colts in March after missing all of last season with a nerve injury that weakened his throwing arm, took just two snaps in the third quarter. But one was a 71-yard touchdown throw to Demaryius Thomas, Manning's first as a Bronco and the 400th of his career. "I love those guys," Manning said. "Brett and Dan are two of my favorite quarterbacks of all time. I don't feel like I belong in their category. But to be sort of mentioned among them is a true honor." Manning, however, didn't even keep the ball for his trophy case. "I talked to him after the game and said, `You're going to let me keep the ball right?' He got one of the game balls, so he gave me that ball," Thomas said. "That's great to be able to catch his 400th. Hopefully, he'll sign it for me. I can go back and show my grandkids in the record book." Manning, who hadn't played in a game that counted since Jan. 8, 2011, spent much of his night on the sideline as Roethlisberger led a clock-chewing offense that had Denver's defenders gassed and Manning antsy as the Steelers converted 11 of 19 third downs. "That's what Peyton kept saying to me: 'You guys killed us on third down.' We did," Roethlisberger said. "But at the end of the day, it doesn't matter when you lose the game." At one point, Roethlisberger had taken 30 snaps to Manning's one  a kneel-down  during two monstrous drives that spanned halftime. "Roethlisberger was awesome on third down," Manning said. "Wasn't much fun sitting on the bench there all night. Great job by our defense in the end, getting that turnover." "That was our intention," Tomlin said. "We need to possess the ball, we needed to get stops and time of possession is just that, though you look at the scoreboard, they got it done, we didn't. The plan didn't come to fruition." After going to the no-huddle midway through the first half, he led Denver on three straight 80-yard touchdown drives, picking apart Pittsburgh's defense with precision. "It helped a lot," Manning said of the hurry-up. "We're going to use the no-huddle as a change-up. Once we did it, it went so well, the coaches kind of said stay with it. I was kind of afraid that might happen." The Broncos' last drive stalled at the Steelers 8 and they settled for Matt Prater's short field goal and a 25-19 lead with 3 minutes left. "Better late than never," said Von Miller, who had two of those sacks. "That was a great feeling," Manning said. "I hated having to settle for a field goal down there. ... I wanted to get a touchdown, make it a two-score game. You don't like giving the ball to Ben on a two-minute drive. Our defense had been bending all game but never quite breaking. That was a huge play by Porter. Von was bringing the pass rush at the end there, that was fun to see." Manning's 71-yard TD to Thomas gave Denver a 14-13 lead, but the drive took all of 36 seconds, and the Steelers had possession for the rest of the third quarter, running 27 plays against a gassed Denver defense. Although this one was a screen pass, Thomas' long TD was reminiscent of his 80-yard touchdown on a crossing pattern on the first play of overtime that beat the Steelers 29-23 in the AFC wild-card game eight months ago when Denver was Tim Tebow's turf. "What can you say?" Steelers safety Troy Polamalu said. "I mean, he's Peyton Manning. He's the same Manning. Everything anybody has ever said about him is probably the same thing I would say tonight."